Average number of patients for RNs in Montana? Usually, hospitals in LV only do new grad programs in the summer. They start in May/June. My advice to any new grad is to make yourself more marketable by that time. Have ACLS, BLS, and PALS. Know the director and/or managers names of the unit you are applying to and check up on the status of your application frequently. I know you guys may be thinking that next summer you will be an "old" new grad, but don't let that discourage you. You are just as good as a "new" new grad that will be graduating this December and this May. Has anyone thought of applying to LPN jobs and offering to work as an RN at an LPN wage? That is what one of my coworkers did. She worked as an RN at an LPN wage for six months at a LTC facility until she scored a new grad job on the floor I worked at. Hang in there! Don't give up! To be honest with you, further certifications (such as ACLS, PALS) will not be a deal breaker in you getting a job. My advice is for you to just wait and take the class for free. I work with some nurses that use to work at Kalispell Regional. From what I have heard, the pay is poor and they do not treat their employees well. Kalispell is beautiful, though. As a new grad, I made $28. Now, nearly two years out, I have switched jobs and make a bit more. You can easily make at least $27. Should I continue or should I not????? Maybe the school offers a part-time program? Oh, sorry. I meant that the Sunrise hospitals all do hair analysis, along with urine. The Valley Health System hospitals do not do hair analysis....just urine. The Sunrise Hospital system (Sunrise, Southern Hills, and Mountain View Hospitals) all do hair analysis. I know the Valley Health system hospitals do not. Not sure about St. Rose hospitals. Seven patients on a step down floor? As in a ICU step down?!? Run. Am I the only one who doesnt even have time to assess their patient's somedays? You are not stupid. Being a new grad is a scary thing. I have been on a M/S floor since June and I still ask questions every day. It's only your second day of being on your own! Give yourself time. Learn from your mistakes. You will get the hang of it. Also the other new grad with LVN experience...she has had experience that you have never had. She had been able to develop routines you have never gotten the chance to do, and see things that you haven't had the chance to see. Don't compare yourself to others, because everyone is different and everyone learns differently. Stick with it. It was only your second day. That is ridiculous! I would do the same thing you are doing...putting in my notice and getting the heck out of there! Just the other night, I had the same question asked to me. We have a new doctor, and a young one at that. Poor thing is having the hardest time working night shift. I have been blessed with being able to sleep anytime of the day or night, just as long as I am tired. The new doc said, "Once I even get a glimpse of sunlight, my body wants to wake up. So I put my mattress in my closet." How big this closet is, I don't know. But black out curtains do exist, and they work wonderfully. Some doctors are brilliant...just not so much with common sense. 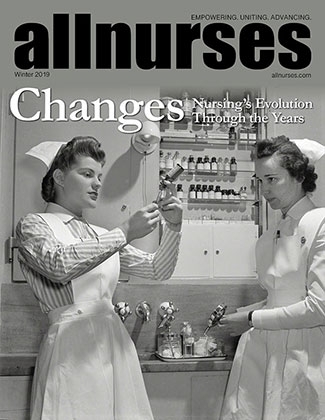 When I was a Nurse Apprentice in NV while going to school, we also had ambubags in every room. I will definently ask our educator about that. I also thought that it was odd that we only had one on the whole unit! It's weird that I don't think about these things until I actually need them. Also, although we have suction equipment in every room, we don't set the suction up in all the rooms; only for seizure precautions, r/o CVA/TIA, and aspiration precaution patients. You know, I was thinking the same thing about my patient. Being a 23 y.o. with all these health issues, mainly because of drug abuse. It really does break my heart. but because of the experience he gave me, I know I will be more prepared from here on out. I was fumbling around like a lunatic. Sheesh.